In fact, there's a bodega conveniently located between the subway and my apartment that displays its watermelons prominently near the entrance. In the past few weeks I've bought more watermelon quarters there than I can remember. Usually I just take the watermelon home, cut it up into small bite-sized pieces, and store them in Tupperware in the fridge. I take so many snack breaks that the watermelon is gone in 1 or 2 days. To make the watermelon last a bit longer, I decided to turn my most recent purchase into a frozen dessert. Ice cream was a bit too time-consuming, so I did a watermelon and mint granita similar to a hibiscus granita I blogged about a few years ago on Appetite for China. It's quite simple. 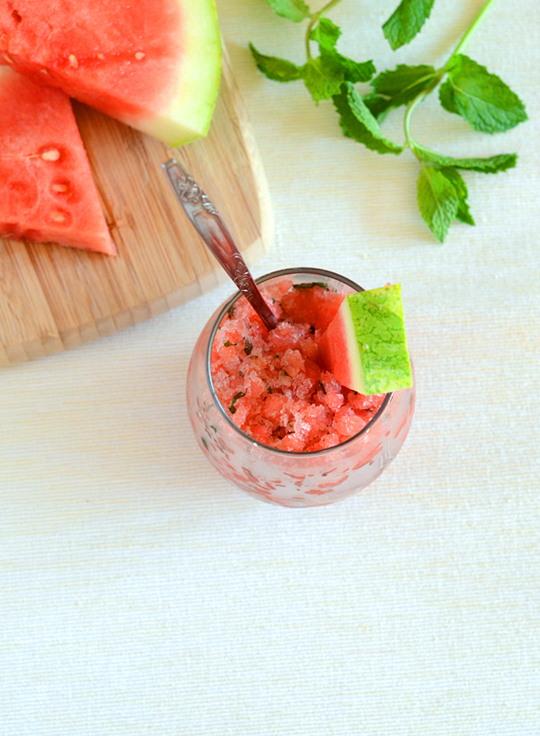 You puree the watermelon pieces and mix in some sugar syrup, lime juice, and chopped mint. White rum goes together with watermelon so naturally that I had to add a splash, though you can of course leave it out. Then you divide the mixture into shallow bowls, freeze it for a few hours, and use a fork to mash it every so often so you get small icy chunks instead of one frozen block. It's the easiest frozen dessert to make without an ice cream maker. And if you're like me, working from home without the AC on full blast, it really helps to have a constant supply of this in the freezer. In a small saucepan, bring the water to a simmer. Add the sugar and stir until dissolved. Set aside to cool. In a large bowl, stir together the watermelon, sugar syrup, lime juice, optional rum, and mint. Divide the mixture into shallow bowls. Freeze, using a fork to mash the large chunks of ice every 30 minutes, until the mixture reaches a granita-like consistency (about 3 to 4 hours, or freeze for longer before serving if you choose.) Dish into individual glasses and serve.